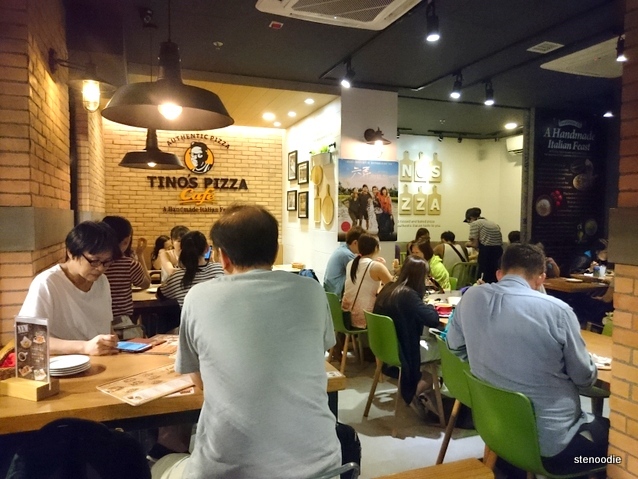 Tino’s Pizza Café is located in Tai Po in Hong Kong. 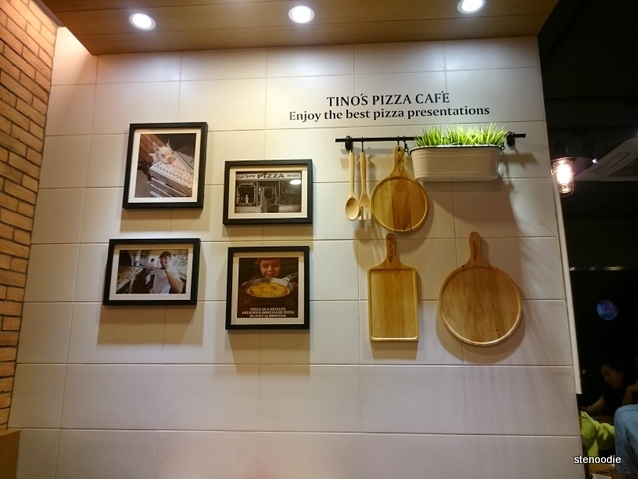 It is a nicely designed modern café and boasts authentic pizza and Italian dishes. 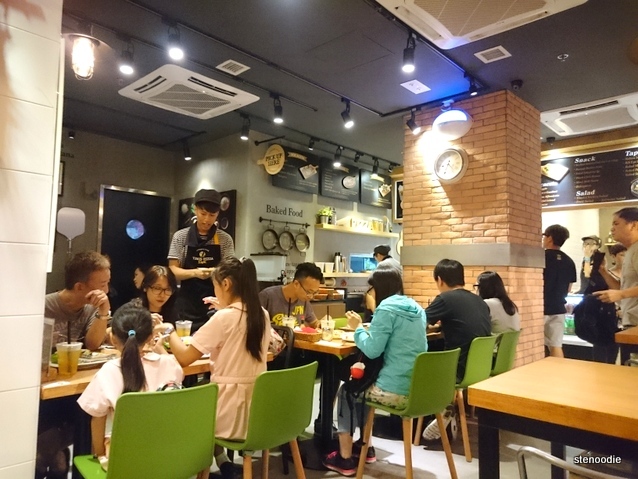 We had dinner here with our relatives and ordered two sets of the two-person meal as well as an add-on. We had a lot of food and we paced eating it since we were arriving for my cousin to arrive after work. 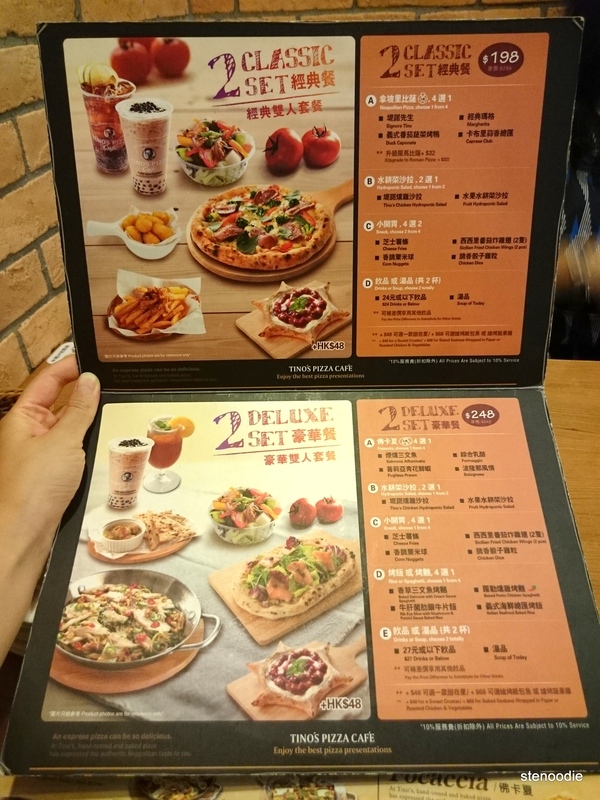 Thus, we ordered one set and finished it before ordering the second one. 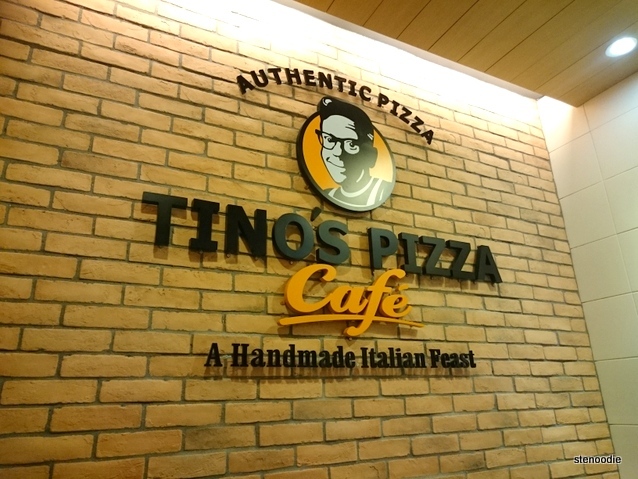 This place got really packed and there were people lining up outside too. Good thing we got there early at 7:30 p.m. 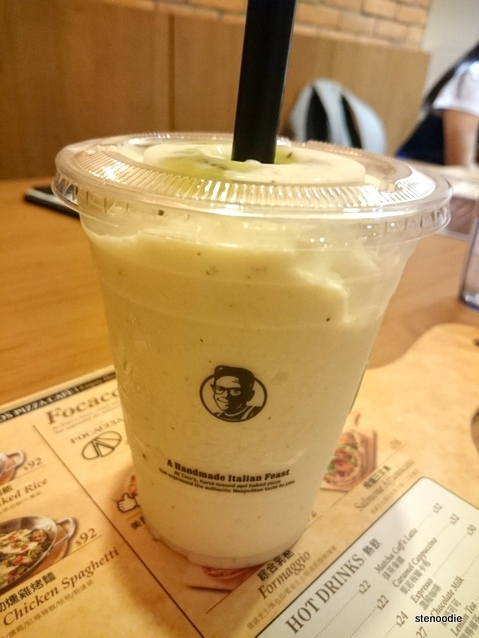 The kiwi and banana smoothie was yummy and I liked the kiwi chunks near the top of the smoothie. 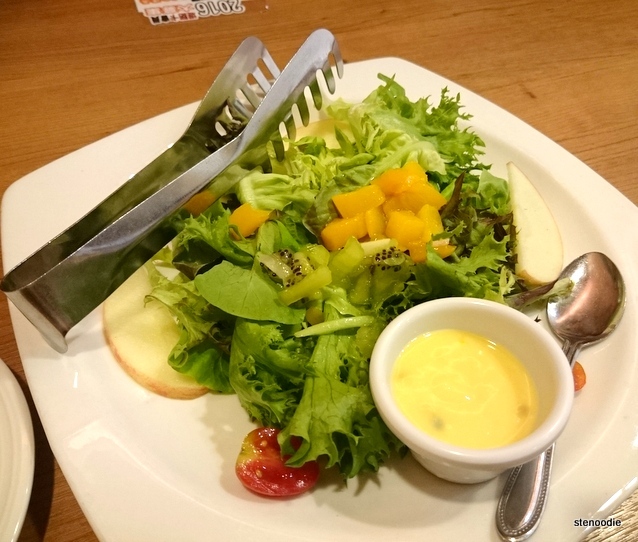 The Fruit Hydroponic Salad was fresh and simple. That dressing was incredible! The Black Truffle Pate Fries smelled so good and I especially like the truffle and garlic bits. 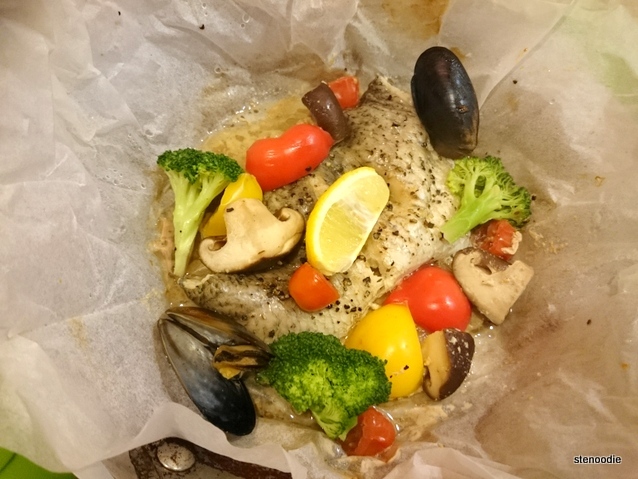 The Baked Seabass Wrapped in Paper was served on a hot pan and turned out to be so delicious! I couldn’t believe how tender the fish turned out to be! 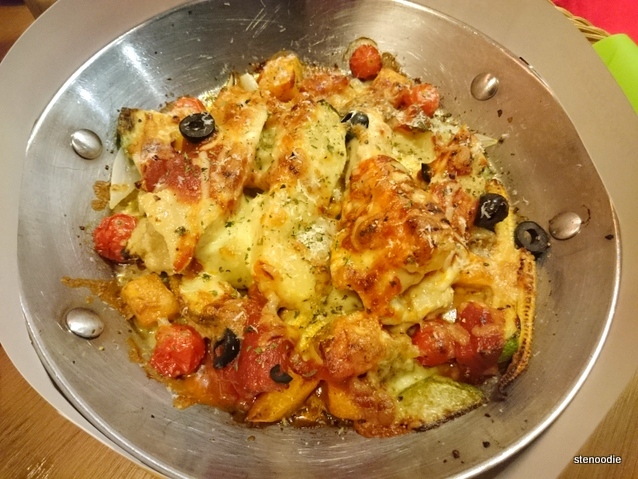 The accompanying vegetables also were roasted nicely. Next, we had the second set! 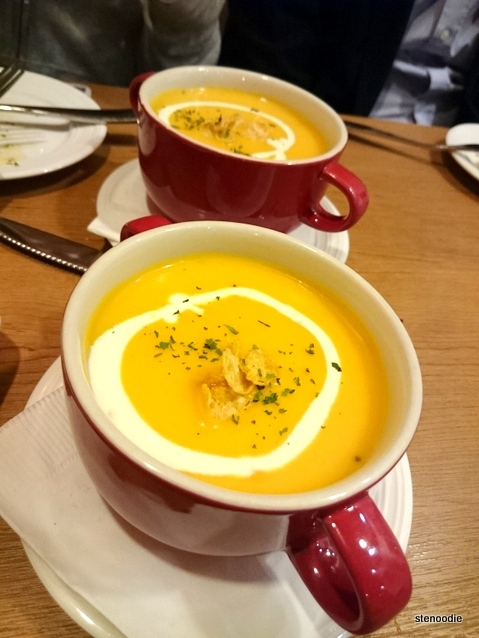 Instead of a drink, I chose the soup of the day this time which was a creamy pumpkin soup. 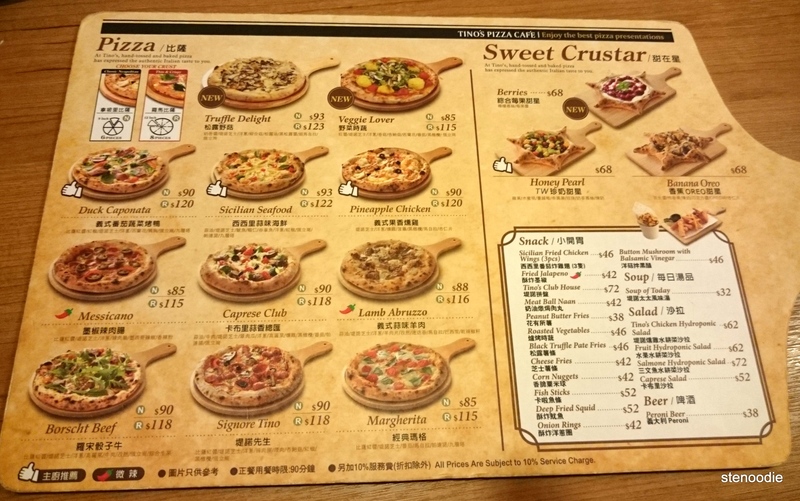 It was quite good and had some crunchy corn flakes on the top of it. 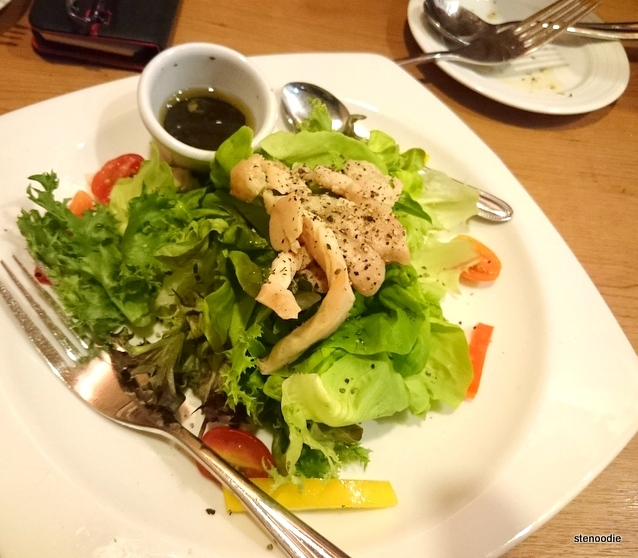 The Tino’s Chicken Hydroponic Salad had the same fresh cabbage leaves as the first salad. 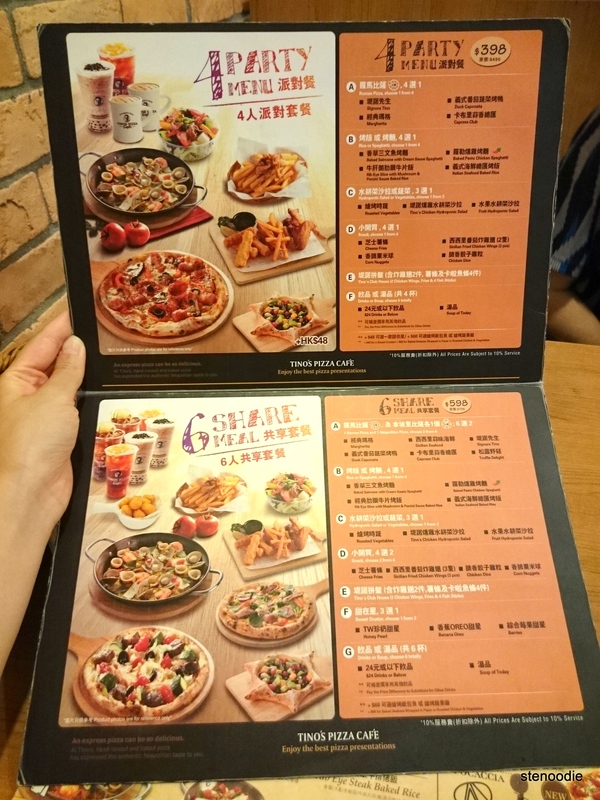 The chicken slices were sooo tender and slim. The olive oil and balsamic vinaigrette made the salad to refreshing and easy to eat. 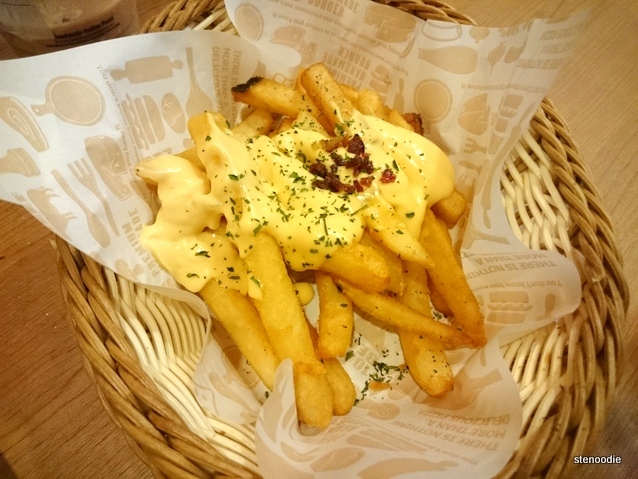 The Cheese Fries had a lot of creamy and cheesy cheese! 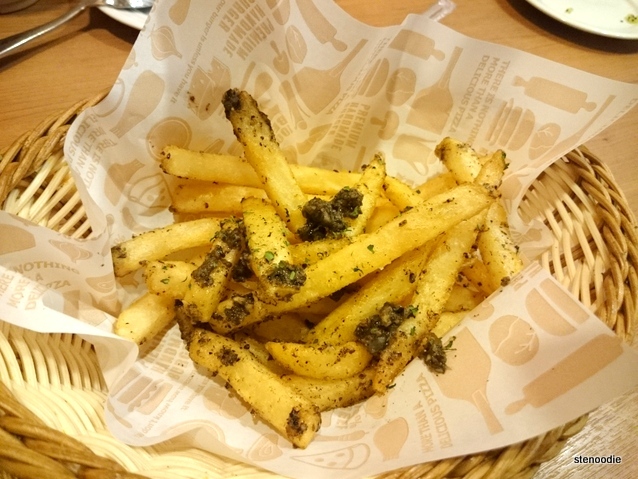 The fries’ texture were the same as the Black Truffle Pate Fries previously. 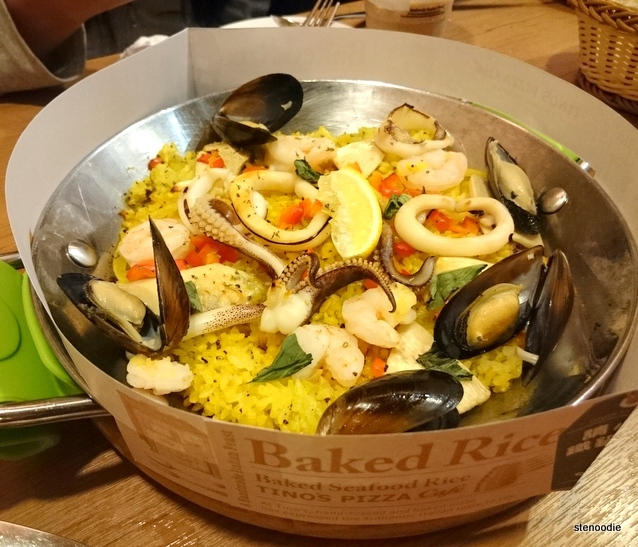 The Italian Seafood Baked Rice dish resembled paella and contained shrimp, clams, squid, and rice. It was decent. 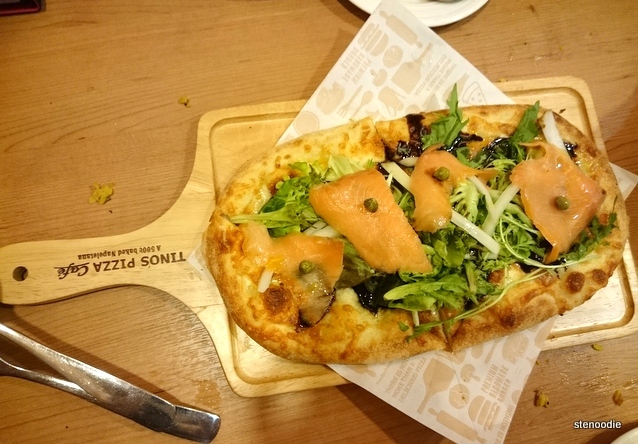 The Salmon Affumicato Focaccia was really really good! The smoked salmon was really thin and sat on top of more arugula leaves and balsamic vinegar. 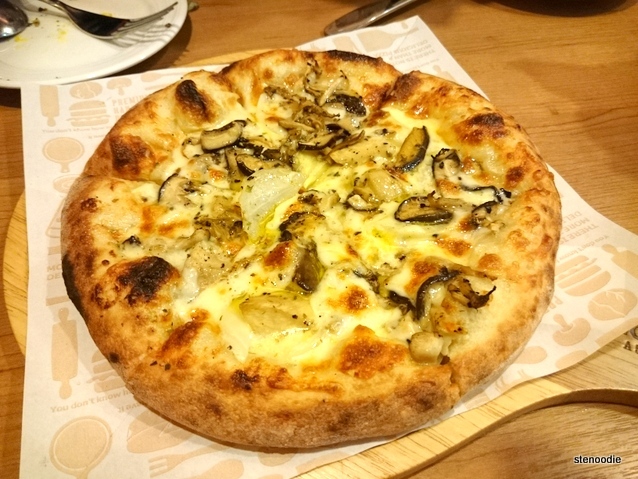 This made it a really appetizing focaccia to eat and not heavy at all. 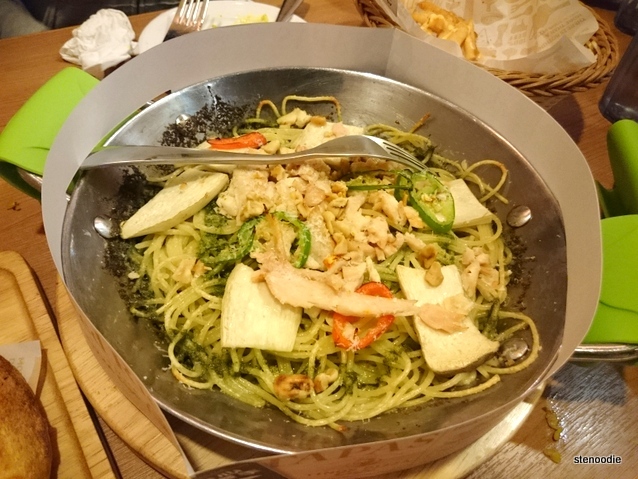 The Baked Pesto Chicken Spaghetti had the same tender and slim chicken as the salad. The spaghetti was thin and al dente. We ordered a Roasted Chicken & Vegetables pan. 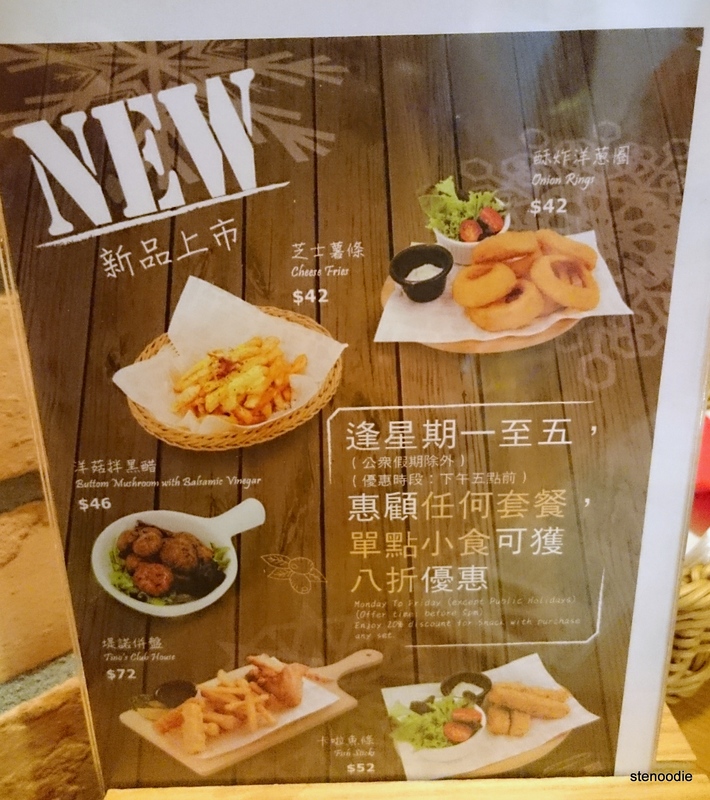 The chicken chunks were huge and quite tender. There were veggies in this but I wish the dish had a more even split of chicken and veggies instead of the chicken dominating the dish. 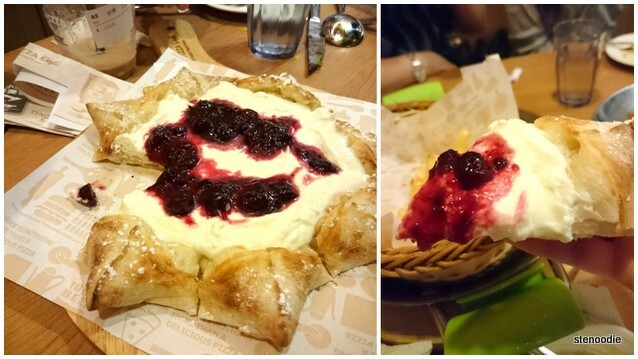 Last but not least, we finished with a Sweet Crustar with Berries. 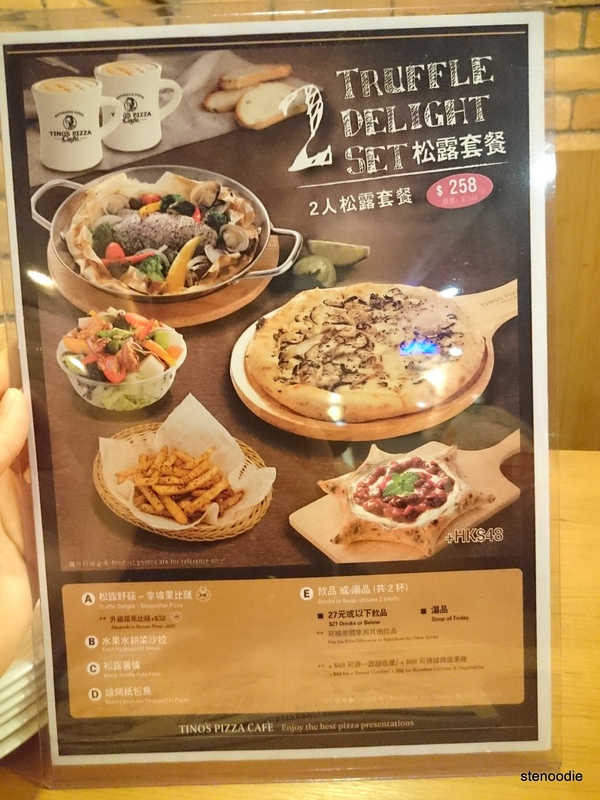 This looked more appetizing in the menu stock photo than the real one on our table. 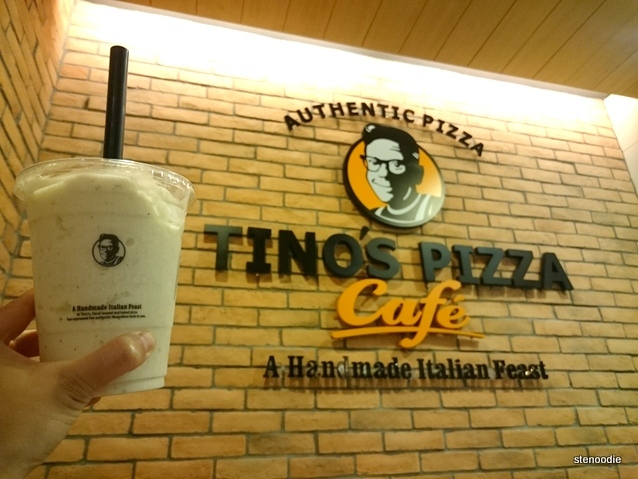 This was definitely a case where the real deal tasted better than its presentation. 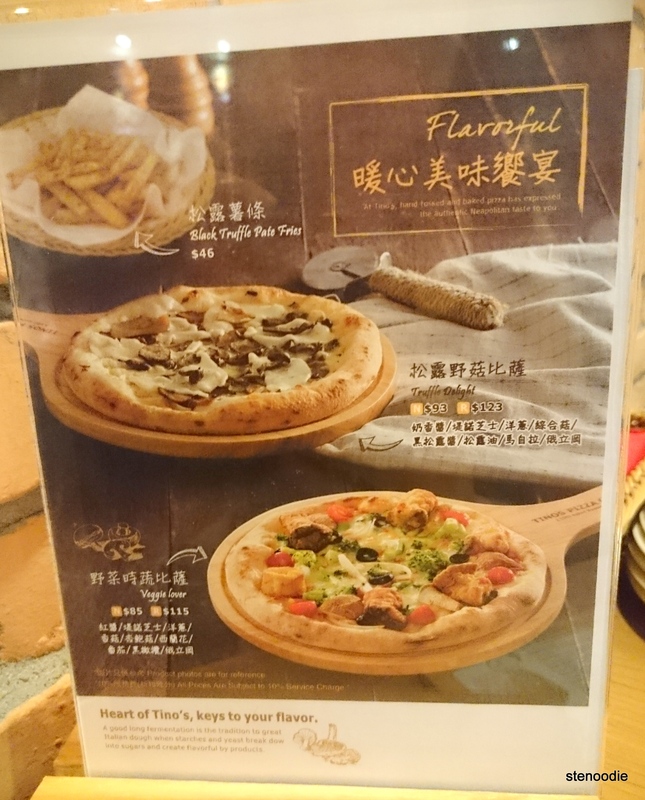 It was a pull-apart pie and like a pizza, it had a fluffy crust. It had yogurt with berries on it and was incredibly creamy and so delicious! 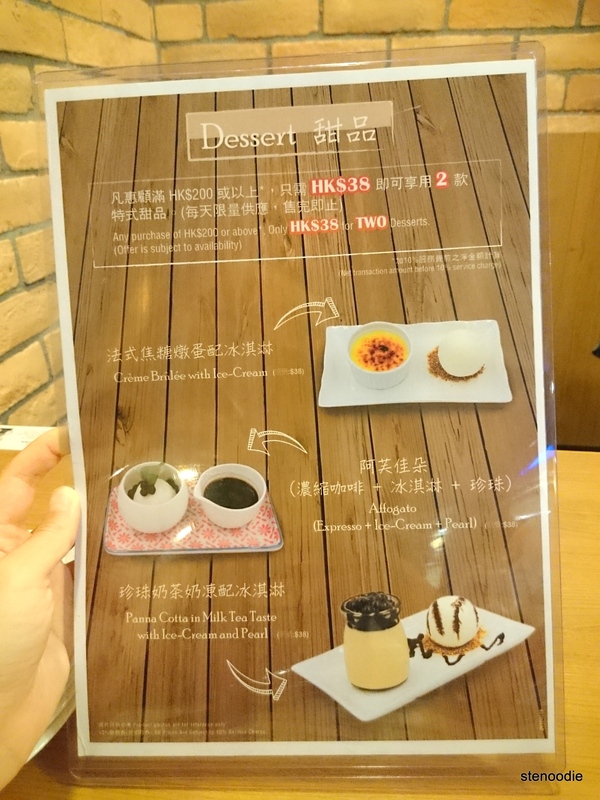 For a dessert, it didn’t taste heavy at all and was so light! I loved this (even though I was already full beyond bursting by this point). We had overstayed our visit and were the final ones to leave the store. We left just after 10 p.m.
What a hugely satisfying meal that was!!! 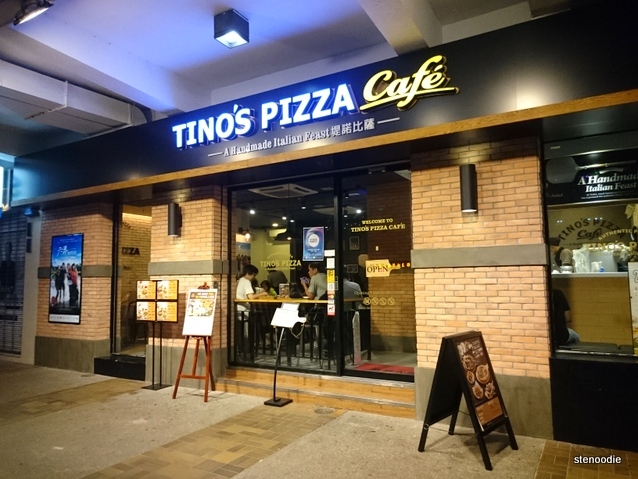 If you are looking for an Italian meal (I would say pseudo-Italian), then go to Tino’s Pizza Café. 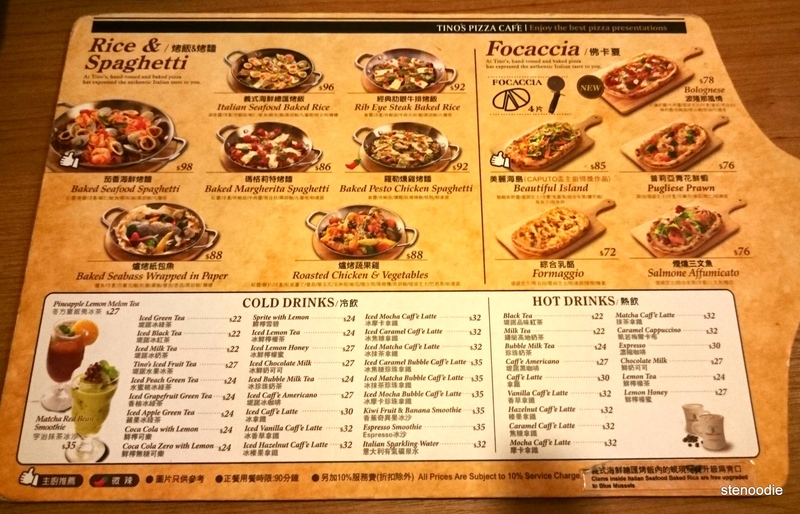 I hear they have several franchises around Hong Kong too! This entry was posted in Food and tagged Baked Pesto Chicken Spaghetti, Baked Seabass Wrapped in Paper, Black Truffle Pate Fries, Cheese Fries, food blog, foodie, Fruit Hydroponic Salad, Hong Kong, Hong Kong restaurants, Italian, Italian restaurant in Hong Kong, Italian Seafood Baked Rice, restaurant review, Roasted Chicken & Vegetables, Salmon Affumicato Focaccia, Shop 20 G/F Eightland Gardens 2 On Chee Road, Sweet Crustar with Berries, Tai Po, Tino's Chicken Hydroponic Salad, Tino's Pizza Café, Tino's Pizza Café HK 堤諾比薩, Truffle Delight Pizza, Truffle pizza, 堤諾比薩, 大埔安慈路2號八號花園地下20號舖. Bookmark the permalink.